As CSA farmers, we will be the first to admit that CSAs are a bit weird. I mean, you are getting a box of veggies that you don't have a complete choice over, which in some ways is kind of the opposite of many modern shopping experiences! On the other hand, it's fun because it makes us all try new things (and who knows, maybe find our next favorite vegetable!). As a CSA farmer, I can tell you that our number one winter planning priority is really trying to nail down the best mix of crops for those boxes to try and make the majority of our members happy and excited by the veggies each week. We spend at least two full weeks each winter just working on this, assessing feedback and how things meshed for the past seasons, and planning out better mixes for the upcoming season. Yup, we plan out every single item in every share for the whole season, though Mother Nature doesn't always cooperate on making those plans work out! In general, we envision the shares as having a nice mix of certain "types" of crops each week: something salad that you can enjoy raw, something that's a cooking green for all our greens lovers, at least one fruiting or podded crop (for all but the first weeks, as these guys tend to need warm weather! ), at least one root crop, and usually one unique or herb sort of crop. During the height of the season when we have more options, we add in more of the fan favorite veggies (broccoli, carrots, and tomatoes), and on weeks where we have some of the more interesting crops or things we know that a number of folks won't like--fennel haters, we are looking at you! ;), we make sure to stock those swap baskets extra well! This year we made a handy dandy graphic to help share a better sense of what will be in the boxes and in the U-Pick fields each month... let us know if you have any questions, have veggies you want to request, or if you want to sign up for the CSA! Top 10 Reasons to Join a CSA! CSAs generally have some of the freshest food around! We grow a mix of different crops and varieties, often for their great flavors. Most vegetables are harvested the morning of the CSA pickup, and washed and chilled until it's time to pack and send the boxes of veggies out into the world. Because of this super-short supply chain, CSA farmers are able to grow varieties for things like taste rather than how they hold up through shipping out to stores. One of our main focuses is to make sure each week's shares have a good mix of different standard crops (like salad greens, cooking greens, root crops, and "fruit" vegetables) that are easy to handle and use. We also focus on adding some variety and a fun or particularly interesting item each week so folks can try new things, without it being overwhelming. 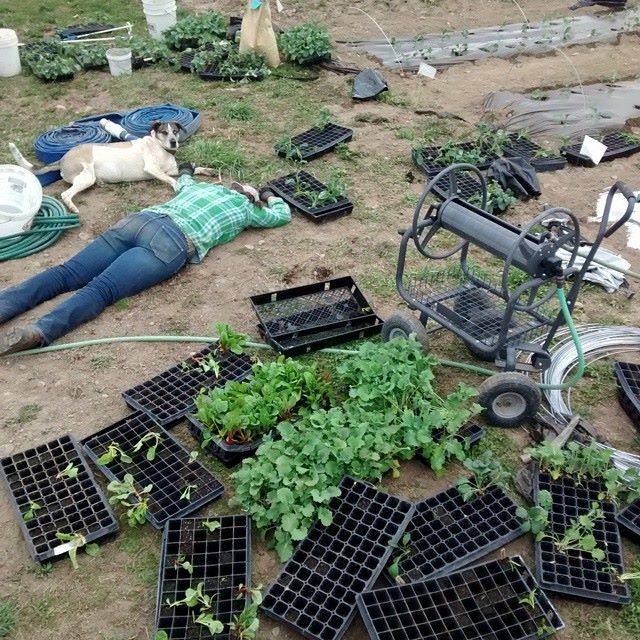 If you can't have your own garden because of your space, work, or vicious deer assaults to defenseless backyard vegetables, CSA (especially if you get a chance to come visit the U-Pick garden) is the next best thing. We also welcome volunteers if you want to spend an hour or two in the fields! Two things that we love to hear from members is how opening your weekly share becomes like a present of food, and how nice it is to visit the farm and relax in the U-Pick flower garden at the end of the week. 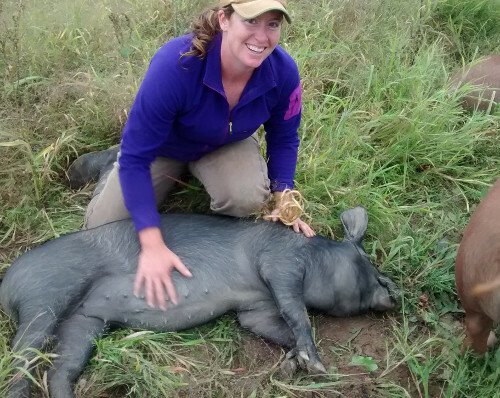 Our farm is open Friday and Saturdays during the season to CSA members (and other times by appointment) and it's a nice chance to see how small scale farming works in the northeast, wander the fields, or visit the pigs and chickens. We want the CSA to be a fun place for you, with an interesting and fun mix of food to inspire your meals! Along the same note, if you have kids or grand-kids (or nieces and nephews), CSA is a great way for them to learn about food and vegetables and farming. Most of the time, kids love getting to see (and help harvest if you visit the U-Pick) where their veggies come from, and hopefully it inspires them to eat more produce! We also notice that fresher, local vegetables taste a LOT sweeter, which is generally a selling point for to get kids to eat them. We have pigs and chickens hanging around the farm all summer, which is fun for children to get to see them grow. Farmer melon taste testing in the field! One of the fun things with CSA is that you get the opportunity to explore and learn about what's best to eat when. Grocery stores are fine since you can find the same things all year long, but with a CSA you really get the chance to see how extra-amazing food tastes when it's the precisely prime season. Nothing is as good as sugar snap peas right off the vine (late June/early July), the intense flavor of a ripe heirloom tomato (August), or the unbelievably sweet post-frost carrots of fall (October)! While we love the opportunity to meet our CSA members and learn what you want us to grow for you, we also hope that you feel free to take the opportunity to visit the farm if you like and get to know us! Like many CSAs, we have a weekly newsletter to share recipes and cooking ideas, as well as the ups and downs of the growing season. Our CSA members are the cornerstone of our farm--we really appreciate your support and enjoy sharing our working family farm with you. We have U-Pick hours on Fridays and Saturdays from July through October and welcome folks to walk around and check the fields out! It's also our members' CSA as well, so we really like to hear member feedback. We definitely add and subtract crops each year due to member input, and we hope that thinking about how your CSA can best serve your needs is fun for you! CSAs are also a good value for members. When you join the CSA you become in a sense a shareholder in the farm for the growing season. We appreciate your support and strive to give you a good return on your investment. Typically (in good and average years), shareholders receive 10 to 15% more vegetables than you pay for over the course of the season. And shareholders also receive a 10% discount on your vegetable purchases at the farmers markets as well. We got into farming because we like to eat, and we like to share our love of food with you. In the weekly newsletter we share ideas on how to prepare and enjoy that week's share, and we love when members share their favorite recipes with us. As farmers, our summertime can get pretty crazy, so we focus a lot on meals that are easy and quick to prepare and can be simple for folks and families also caught in the summertime rush. CSAs by their nature are very tied with the local environment and community. 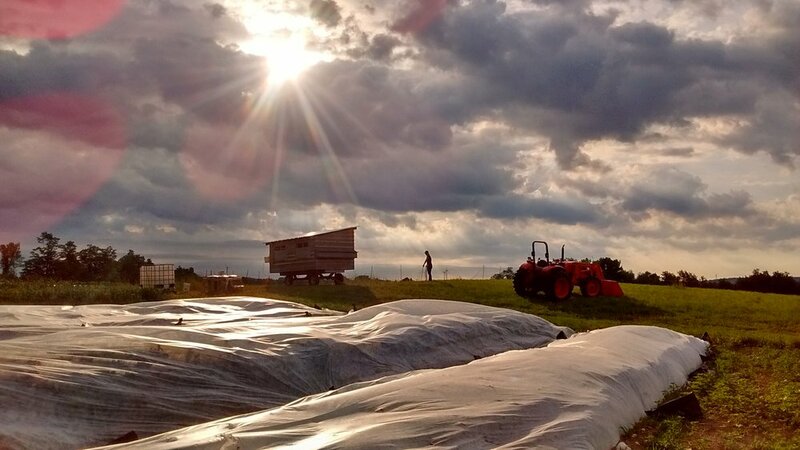 We look at building our CSA and our farm as a long term commitment to the region. We want to grow and adapt with our members to provide the crops that you want, and we want to work with our land to improve it every season so that each year brings a better harvest and a healthier ecosystem. We do this by using a range of organic farming practices, including crop rotation, cover cropping, encouraging good bugs, and a whole lot more (please ask us anytime about how we farm!). We also are committed to the local community and want to make sure that everyone in our community can afford local, healthy food (ask us about our flexible payment plans). When you join a CSA as a shareholder, you help farms build their community and improve their ecosystems--thank you! We hope you consider trying out a CSA this season! 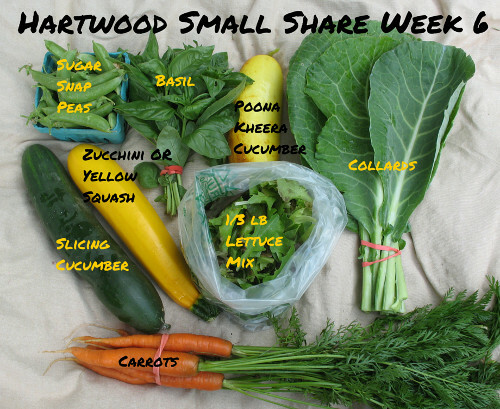 Learn more about Hartwood Farm CSA at the links above!